Last Friday, the 15th, I rushed home from work to pick up my PS4, waited a few hours for the kids to get to bed, and then plugged it in. After getting the patch, exploring the UI, and downloading a few of the freebies, I fired up the PS4 link app on the Vita. The one that was burning a hole in it for the past week. I keyed in the link code, saw the second screen option and remote play one as well, and within moments I was doing what many have been waiting for: remotely operating the PS4 through the Vita. I fired it up just 10 feet away from my system, upstairs about 20 feet away, and the effect was the same. I was able to see the UI, interact with it like I was operating the PS4 itself. (I haven't been able to go test this through another internet spot yet, but will get to that soon in another review). 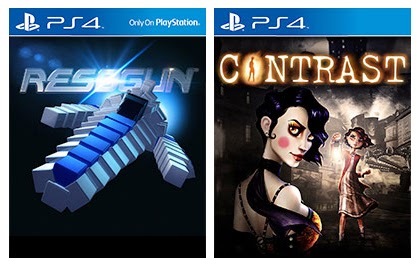 Both PS+ titles are fun to play on the Vita! Screen size is smaller, so adjust your spectacles. I really wish there was an option to pinch the screen and zoom in on a section to see closer. Oh well. There is only a teeny lag between what registers on your TV and what you see on your Vita. Now, if I wanted to use the PS4 menu features and see what my friends were up to, I could do that. I could watch live streams of gameplay from Twitch and Ustream while I chilled in bed. But of course most folks want to play their PS4 games remotely. I've got my PS3 and PS4 hooked up to the same set, so when my kids were playing Rayman Legends on the PS3, I was able to activate the PS4 and go remote. Now, I didn't pick up a launch title (and no publisher sent me a copy of anything) so I will talk a little of how the PS+ and Warframe titles work out in terms of graphics, framerate, and control scheme. That's a lot of particles to display on the Vita! 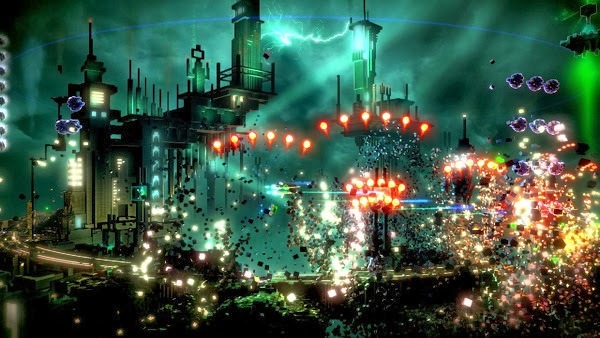 Resogun: Perhaps my favorite PS4 game to play so far. I dug Super Stardust HD, and it's a perk for PS+ owners. Lots of particle explosions, lots of enemies on the screen, lots of crazy action. Remote Play? A couple lag blips hit the play as enemies pour onscreen. Not too bad. But it still is there for me. Other than that, the action is crazy blazing fast and just as fun as on the big screen. For every title I've played, when you push the PS button, it shows a sort of pause screen where you can access the controls for Remote Play. It shows how the buttons are mapped out on the rear touch pad. L2R2 up top, L3R3 down bottom. Simple. Is it easy to access the buttons? Well, it took me a little while to get the feel for it, but it works. I'll need to practice up to get the same twitch control I get on the Dualshock 4 (DS4). (which is a dream controller, BTW). 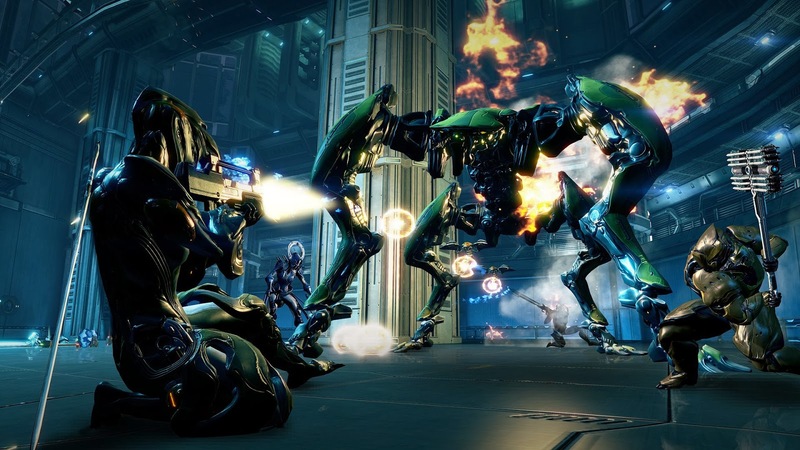 Warframe: A fun, free to play action game where you team up online to finish levels. It's pretty fun, but I haven't played too much of it. Remote Play: Again, the screen size is puny trying to see the whole PS4 screen in the Vita. But, once you fire up the action, there was no lag, and I was able to keep up pretty much as I had on the PS4. Controls for this are a little whack on remote. On the DS4 you aim with the L2 button, but on Remote Play you use the D pad. What? I gave up on that and just aimed with the reticule without pulling up the iron sights, as it were. That deal makes it hard to move and aim at the same time. So far I'm impressed with the Remote Play feature. Like I said, I will get this thing fired up across town when I can and report back to you all to get some more info on this feature. Speed for me is nice here at home. I have 15 mbps for internet. Graphics? Check. They look sharp on the Vita. Maybe not as popping out colors like a normal Vita title, but still pretty. Negatives? The screen is tiny for reading details! I imagine the Vita TV will be a big hit in this respect. Once you can stream your PS4 onto another big screen it will be nice. But I get to dig out my reading glasses now every time I want to actually read the screen. (This makes me worried about playing big RPGs that have a lot of small print). I will keep tweaking with the Remote Play feature, get some info from players who have played AC4, BF4, and Killzone. More soon, so stay tuned! Comment below if you've done remote play, and what do you think? Anybody use the second screen in Knack? What other questions do you have?